In the performing arts world it is almost canon law that the show must go on. For the cast and crew of Ford’s Theatre’s The Laramie Project that meant finding a performance space for their production after Tuesday’s Government Shutdown resulted in the National Parks Service forcing the closure the famed theatre. I learned about the events of that faithful day in an interview with Paul R. Tetreault, the Theatre Director for Ford’s Theatre. The staff arrived to work at 8:30 unsure on how the Shutdown would affect their production. In past government closures the theatre has been allowed to produce theatrical productions. This production of The Laramie Project doesn’t use any federal employees or funds, however the theatre facility is funded by both the Ford’s Theatre Society, a nonprofit entity, and the National Parks Service. “We thought we’d be beneath the radar… the Federal government has bigger issues than little ol’ Fords Theatre.” Tetreault explained. At 10:30 that morning Tetreault was hand-delivered a letter from the Director of the National Parks Service informing them that the facility will be closed for the duration of the shutdown. Suddenly The Laramie Project was out on the street without a home. The next move for Tetreault and company was clear: find a new space for Tuesday’s performance. Ford’s Theatre typically holds around 650 patrons, it would be hard to find a space in nine hours that would accommodate that many people. The theatre placed calls to nearby Shakespeare Theatre Company and Woolly Mammoth Theatre Company. Around noon Ford’s snagged a rehearsal hall at Woolly. The production staff decided to go forward with a performance for members of the press as well as DC metro teachers that were conducting educational outreach related to the show. The audience of 650 was cut down to 70. “The show is an intimidate story told by a company of 8 actors- it’s not about flashy scenery or big production numbers. It’s not about that,” Tetreault remarked. This production of The Laramie Project also had special meaning as it coincides with the 15th anniversary of Matthew Shepard’s death this month. The production presented on Tuesday was a stripped down, bare-bones performance. No sets, basic lighting, no projections or other theatrics. Just the hardwood floor of the rehearsal hall, some chairs, a desk, and a black curtain where the 10-person ensemble ducked behind to change costumes. While I cannot talk about the show as it was originally envisioned for the stage at Ford’s, what I will say is that director Matt Gardiner and his cast displayed a strong, moving performance after spending only two hours in their new space. It helped that The Laramie Project feeds off powerful performances and if anything the performances were augmented by the intimacy of the small rehearsal room. Based on first-person research done by Moisés Kaufman and the Tectonic Theater Project, The Laramie Project unfolds like a live action documentary. 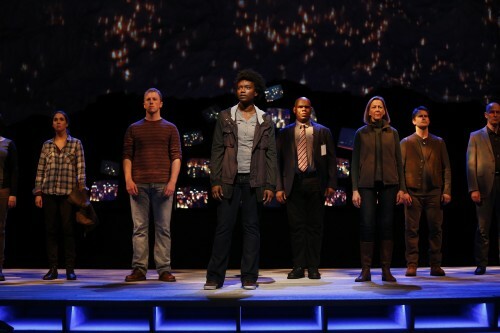 The ensemble portrays various people involved in the brutal beating and murder of gay student Matthew Shepard in 1998. The individual asides and monologues come together to create a moving drama that explores all sides of the incident. Gardiner’s cast is a venerable all-star line-up with fantastic performances from Mitchell Hebert, Kimberly Gilbert, and Craig Wallace among others. The acting was strong enough to shine through the technical limitations of the night. With the shutdown entering its first weekend, Ford’s has found an additional venue over at the First Congregational United Church of Christ. The theatre held a free performance this past Thursday and will have an additional one Tuesday October 8th at 7:30 PM. Free tickets will be given out starting at 6:30 PM. After that? The future is uncertain. In the event the Government Shutdown is lifted performances will most likely resume at Ford’s Theatre but til then? Ford’s Theatre’s production of The Laramie Project performs October 8th at First Congregational United Church of Christ, located at 945 G Street, NW Washington, DC 20001. Closest Metro stop: Metro Center (Blue/Orange/Red lines). Admission is free.